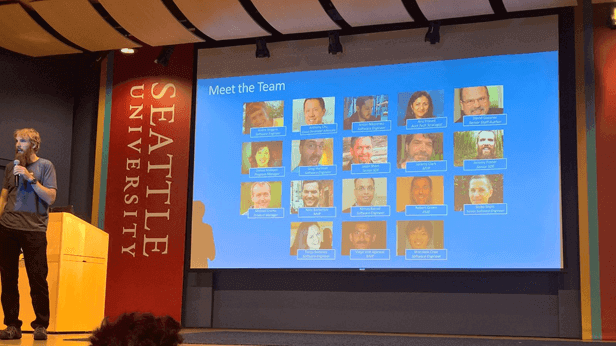 Seattle Code Camp started with a Keynote from Microsoft’s Jeremy Foster and he shared a slide with all Microsoft MVPs (Most Valuable Professionals) and FTEs (Full Time Employees) who were speaking at 09/09/2017 Seattle Code Camp. 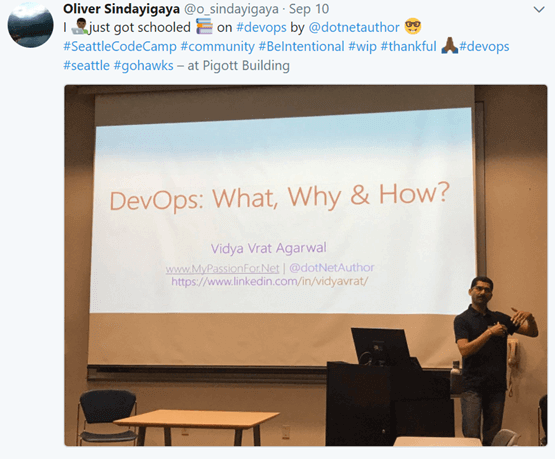 I spoke at Seattle Code Camp 2017 on 09/09/2017 and covered two topics. 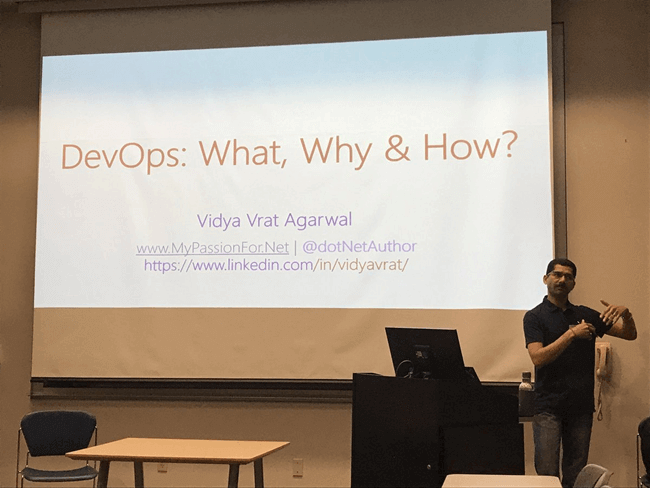 DevOps: What, why and how? 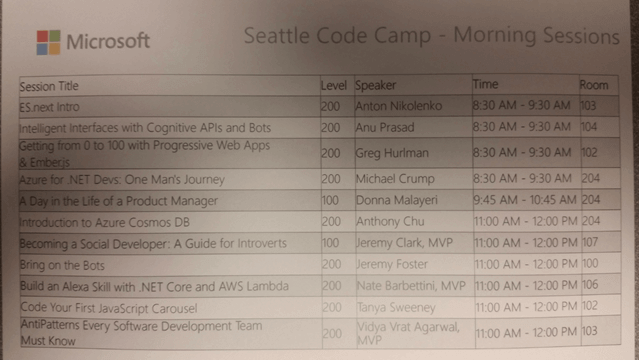 Seattle Code Camp started with a Keynote from Microsoft’s Jeremy Foster and he shared a slide with all Microsoft MVPs (Most Valuable Professionals) and FTEs (Full Time Employee) who were speaking at 09/09/2017 Seattle Code Camp. My first session, on AntiPattern, was in Room #103 from 11 am -12 pm. I gave a brief introduction and began with the presentation. As I already set the expectation with the audience, I kept it very interactive and many participated to share knowledge and experiences with others. Some of the attendees even spoke to their friends at the lunch break and recommended that they attend my next session. 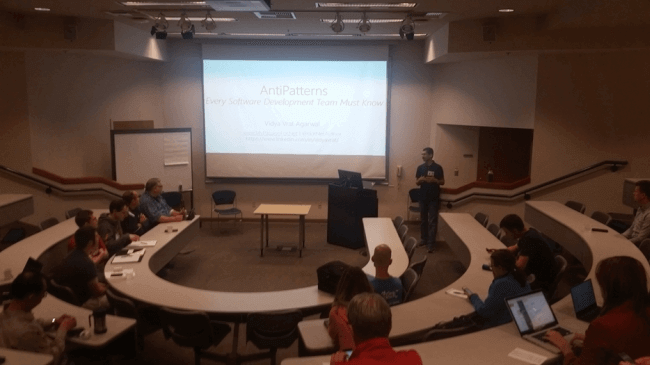 Some of the attendees returned for the second session on DevOps at 1-2pm and some mentioned that it was the best talk they attended. Well, I thank them for their kind words and patience for providing me with an opportunity to share my thoughts with them. Slides are available at here. Send me a message using Contact Me tab on the blog.